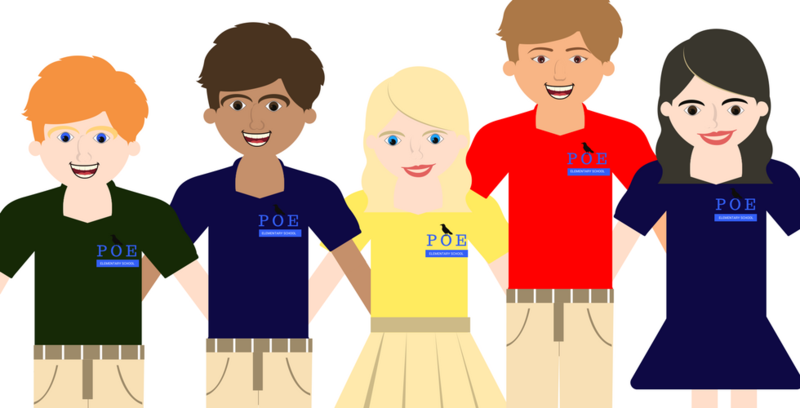 The school uniform includes an embroidered Poe shirt and khaki pants, shorts, skirts or jumpers. Shoes must be closed-toed and appropriate for PE and recess (no crocs). You can buy the uniform in person at our Uniform Store with cash/check/credit card. It is open on Tuesday mornings from 7:30am - 8:30am all school year. Please be advised that we cannot accept returns on clothing that has been worn and/or washed. To return or exchange unworn clothing, please visit the Uniform Store during one of the Back-to-School nights or during store hours during the school year on Tuesdays between 7:30 am - 8:20 am. Students wear the uniform on most school days. On the last Friday of the month, students may wear any Poe shirt. You will have the option to purchase t-shirts from Poe events (Carnival, Auction, All Art day) during the year and have a collection of options for Fridays. During football season, kids can wear Texans gear on the Friday before home games. There will also be a few “free dress” days when students can wear non-uniform clothes. Please contact uniforms@poepto.org if you have any questions.